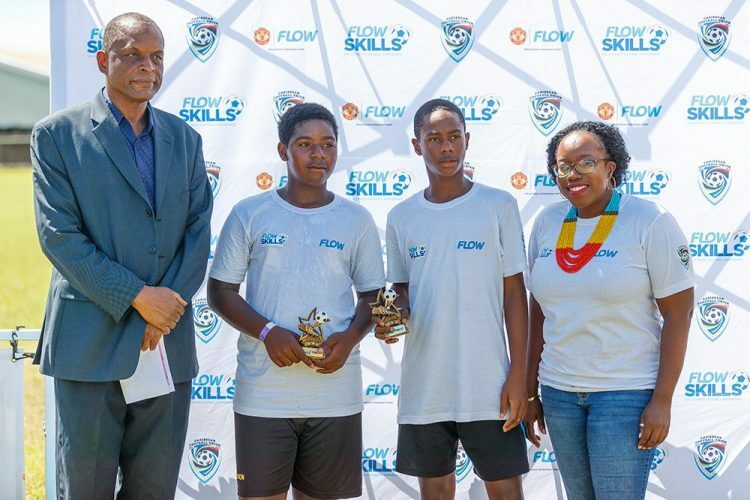 Two young Vincentians now have a chance to be coached by Manchester United football club, having won the local leg of the Flow Ultimate Football Experience last Saturday. The one-day event at the Campden Park Playing Field saw male and female participants being assessed in short passing and dribbling football skills and a short tournament. Oryon Velox, from the Layou Football Club, was chosen from the 12-13 age group, while Denzel Bascombe, from System 3 Football Club, was chosen from the 14-16 age group. Flowâs Marketing and Corporate Communications manager Nikala Williams said it was very natural to collaborate with Manchester United to offer the event. â…We have the leading package for sports all through the region… So, it was quite natural that we needed to use this opportunity to create opportunity for others,â Williams said. She elaborated that Flow will collaborate with the Grassroot Football Programme, which runs throughout the year and which would help perfect the football skills of the youngsters, to better enable them to vie at next yearâs Flow Ultimate Football Experience. Technical director of the St Vincent and the Grenadines Football Federation, Keith Ollivierre said the event will encourage more focus on holistic skill development in football. âBasically, there are two skills that they are performing this morning and I know we in St Vincent tend to focus a bit on the technical ability of players, so I think this would give players, as well as coaches, an opportunity to say hi, itâs not just running and kicking, but also have to look at my overall skill development. Because the activity or the drills are very basic. Just move the ball, turn and shoot. Thatâs basic, so Iâm expecting that they would give us a good showing…,â Ollivierre said. This is the second year that the event, which takes place in the 15 countries where Flow operates, has been held. Two nationals from each country are chosen to compete at the finals in Trinidad and Tobago, accompanied by a parent and their coach. A date for the finals is yet to be set, as the competition continues in the remaining countries.